Technician Jim Riley (left) and hydraulic engineer Dave Goodrich download water-level data from the Rostrin Basin, a flood detention pond in Sierra Vista, Arizona, which will aid in calculating the recharge rate to the ground-water aquifer. In 1988, Congress designated parts of that emerald green ribbon as the San Pedro Riparian National Conservation Area. It’s where around 400 species of birds, 80 species of mammals, and 40 species of reptiles and amphibians make their home. It is also a primary flyway for birds migrating between North, Central, and South America. In 1998, 21 federal, state, and local agencies and groups formed the Upper San Pedro Partnership (USPP) and began looking at ways to meet the region’s long-term water needs. Goodrich and hydrologist Russ Scott, who both work at the ARS Southwest Watershed Research Center in Tucson, Arizona, have been part of the partnership since it started. In the Walnut Gulch Experimental Watershed near Tombstone, Arizona, hydraulic technicians prepare flume number 6 for monitoring the next flow event to determine runoff from a portion of the watershed. Managing water resources in the upper San Pedro River valley isn’t just about plants and animals. The primary economic engine of the area is the U.S. Army’s Fort Huachuca, which depends on the same ground water that sustains the river and its diverse ecosystem. In 2004, Congress directed the U.S. Department of the Interior to work with the U.S. Departments of Agriculture (USDA) and Defense and the USPP to develop water-use management and conservation measures for restoring and maintaining the sustainable yield of the regional aquifer by and after September 30, 2011. The ARS scientists had a bit of a head start. For more than 50 years, USDA scientists have been monitoring watershed dynamics at the Walnut Gulch Experimental Watershed, which drains into the San Pedro River. “Our studies in Walnut Gulch were critical in helping us determine that ephemeral streams, which flow for a short time after heavy rains, make significant contributions to ground-water replenishment. This changed our understanding of ground-water recharge mechanisms in arid regions,” Goodrich says. As more rural land is given over to urban ventures—along with the associated construction of impervious areas like parking lots and roads—these findings will help improve estimates of how the increased storm-water runoff contributes to regional ground-water supplies. Goodrich also used a computer program called “KINEROS2,” which models a range of hydrological processes from small agricultural and urban watersheds, to quantify how the switch from rural to urban land use affected runoff. He added calculations for assessing how variations in channel infiltration and detention-pond design affected surface runoff for subsequent ground-water recharge. 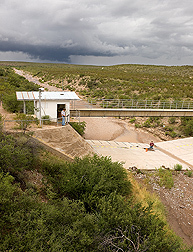 To obtain data for modeling, Goodrich, U.S. Geological Survey scientists, and University of Arizona graduate students set up stream gauges, rain gauges, and other monitoring equipment in two different basins. One was located on undeveloped land at the edge of Fort Huachuca, and the other was in a newly developed area just outside the military installation. Scott, meanwhile, remains focused on learning more about plant demands on the regional ground water. He ran into some surprises as well. For instance, he found that mesquite thickets use much more water than cottonwood and willow trees growing along the riverbanks. “Even though mesquite woodlands don’t grow right along the riverbank, they have good access to ground water because their roots can go 30 feet deep,” Scott says. “And since they’ve been expanding, there are more of them that can tap into the ground-water supply.” Using this work, Scott and others developed a geographic information system-based riparian evaporation and transpiration tool that regional land managers can use to estimate water savings by replacing mesquite with native desert grasses. Scott and Goodrich are pleased with how their research has gone. And they’re just as pleased at how well they’ve been able to work with other USPP members. A 2003 survey of the USPP members and participants found that 90 percent of them considered scientific studies to be among the most important projects undertaken by the partnership. “This is a great example of how ARS research can be directly used to provide advice on policy decisions,” notes ARS national program leader Mark Walbridge. “It can be a challenge to communicate scientific findings, but we’ve been able to successfully work with groups of people who, even though they have very different goals and values, have become knowledgeable about issues involved in ground-water management.”—By Ann Perry, Agricultural Research Service Information Staff. To reach the scientists mentioned in this story, contact Ann Perry, USDA-ARS Information Staff, 5601 Sunnyside Ave., Beltsville, MD 20705-5129; (301) 504-1628. "ARS Scientists Strategize To Save a Desert River" was published in the March 2011 issue of Agricultural Research magazine.